A "New York minute" was explained to me as the time it takes for a New York cabbie to start honking his horn after the light turns green - as in, a millisecond! 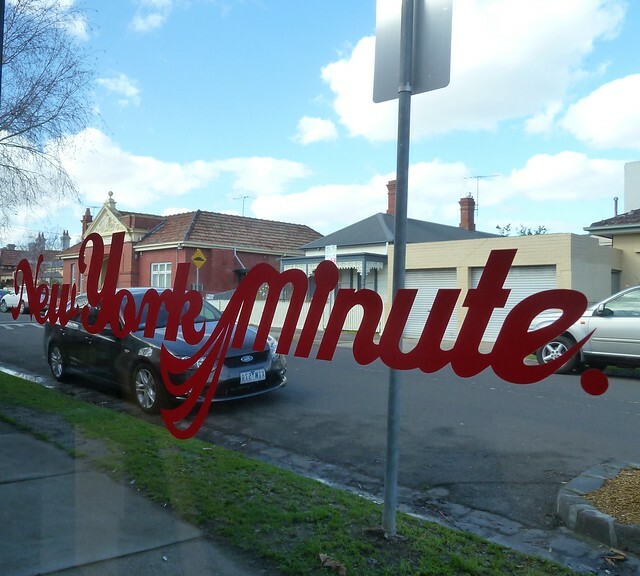 New York Minute is a new cafe in Moonee Ponds doing cafe fare as well as three American-style sangers - pulled pork, brisket and Philly cheesesteak. 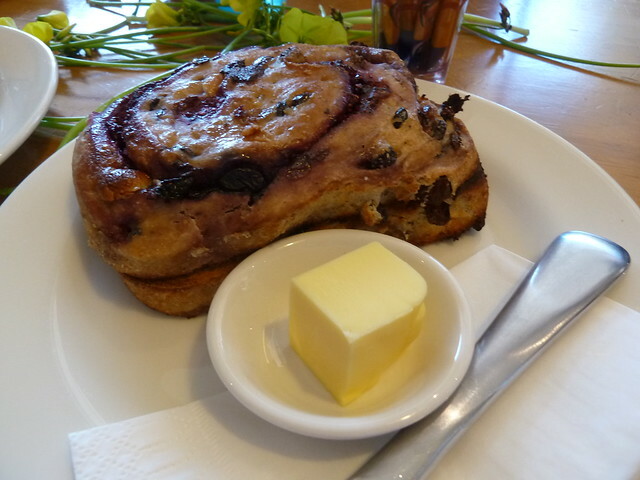 As someone married to an American, I am loving Melbourne's awakening in regard to American food. 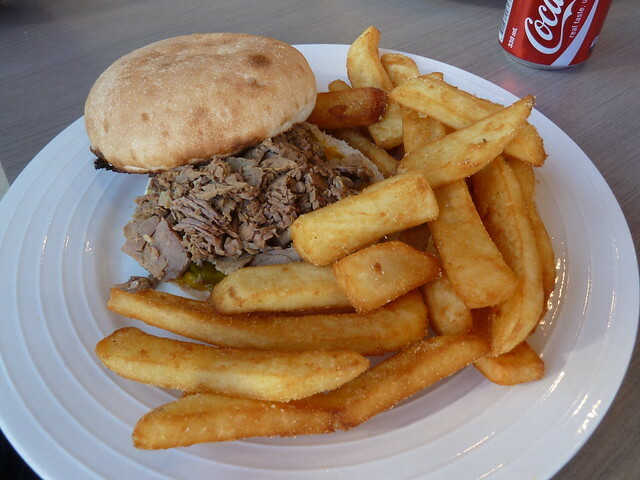 Instead of lazy jokes about American cuisine being McDonald's, Melburnians are now increasingly savvy to and appreciative of American regional fare in all its full-flavoured, all-beef glory. 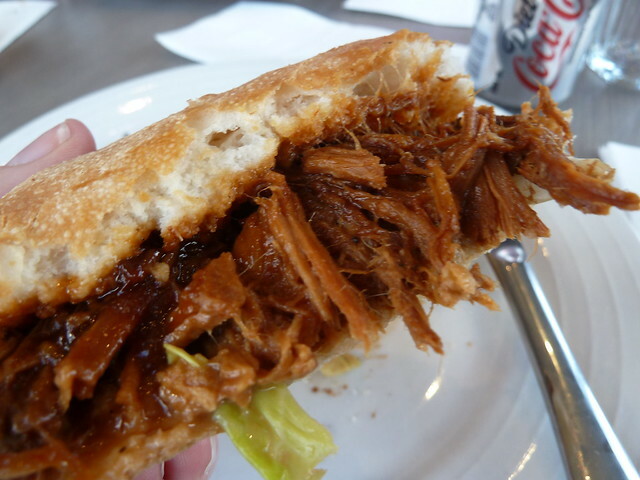 Pulled pork is a whole pork piece (often shoulder) slow cooked, perhaps in a very slow oven or 'Q, before being shredded, tossed with BBQ sauce and slapped on a cheap white bun with loads of creamy 'slaw. I wasn't prepared for how delish New York Minute's version was. True, the BBQ sauce was a bit one dimensional, being very sweet, and there wasn't nearly enough coleslaw, but gosh golly gee I enjoyed every bite. 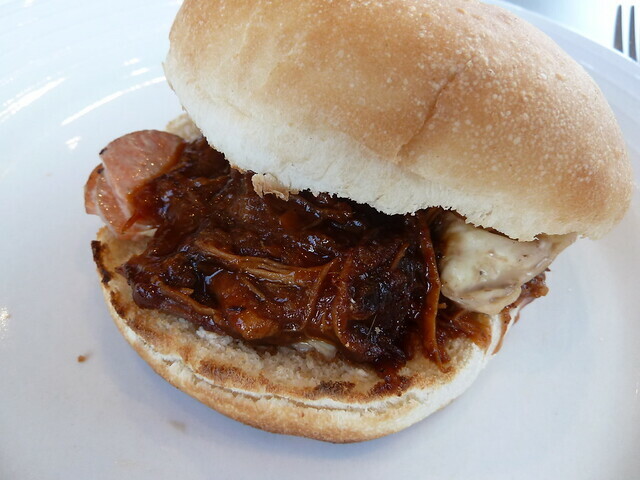 Pulled pork is not hard to make at home. It's not uncommon for people passionate about BBQ to make their own sauce, layering ketchup with brown sugar, vinegar and plenty of spice - there is a myriad of recipes online. My favourite sauce for pulled pork, though, is a regional variation from North Carolina that's just apple cider vinegar, chilli flakes and black pepper. With the rich meat and luscious, mayo-slicked slaw, it's a taste sensation. I have had a Philly cheesesteak - once. 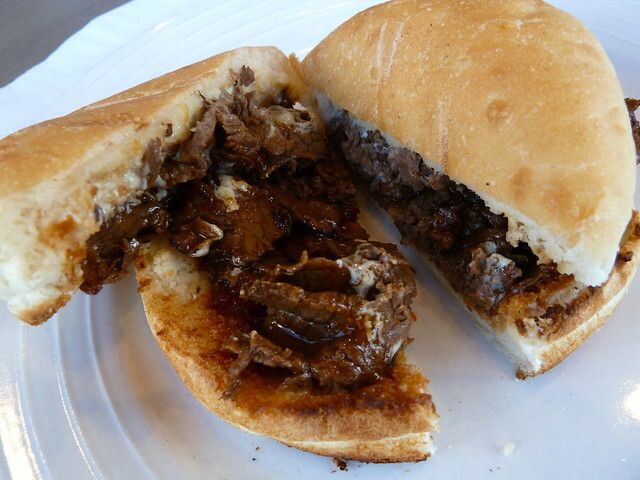 I ate it in Philadelphia, and it was a gut-wrangling combo of sliced steak and craploads of melted orange cheese on a long white roll. This cheesesteak didn't resemble that hometown version, and I have to say it was a huge improvement. Tender, hot sliced steak, richly flavoured, with just a little melted cheese was delicious. Kenny was less enamoured by of his brisket sandwich. It was served cold with a kind of relish. Brisket is one form of American BBQ I'm not familiar with - it's big in Texas, which I've yet to visit. 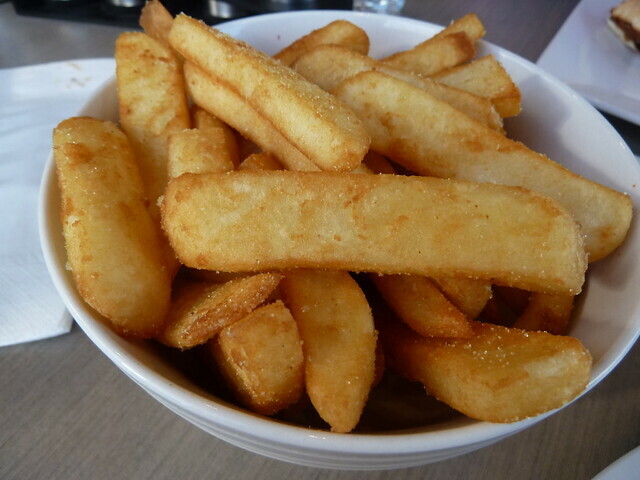 Loved these chunky steak fries so much we had to order another bowl. Perfectly crisp with seasoned salt. 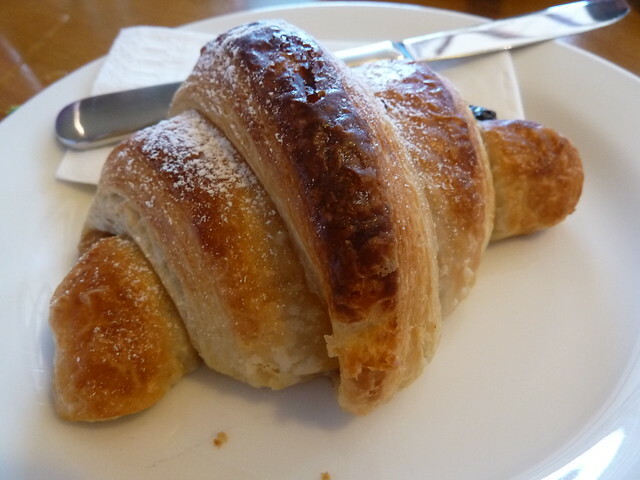 Who would have thought this cafe in such a fly-over strip would yield such yumminess? 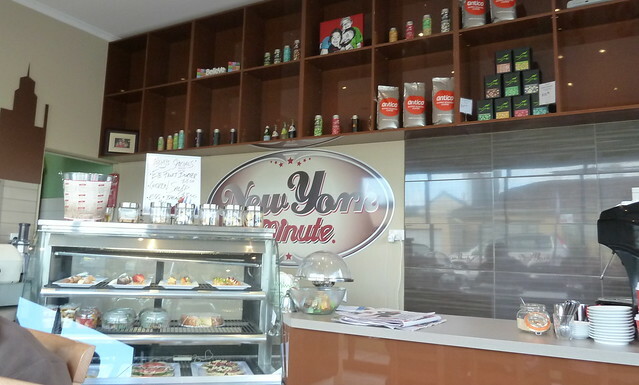 Western Melbourne, until our councils let the food trucks in and until the food trucks deign to come here, you can get your 'Q fix at New York Minute. 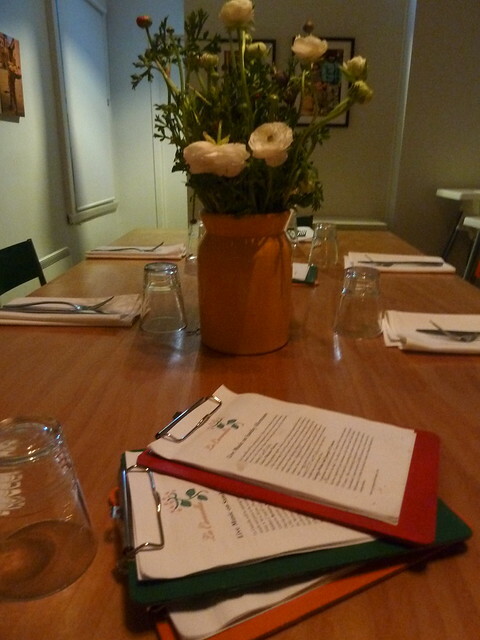 Thank you Kenny of Consider the Sauce for the tip, and lovely to meet Nat Stockley of Urbanspoon! 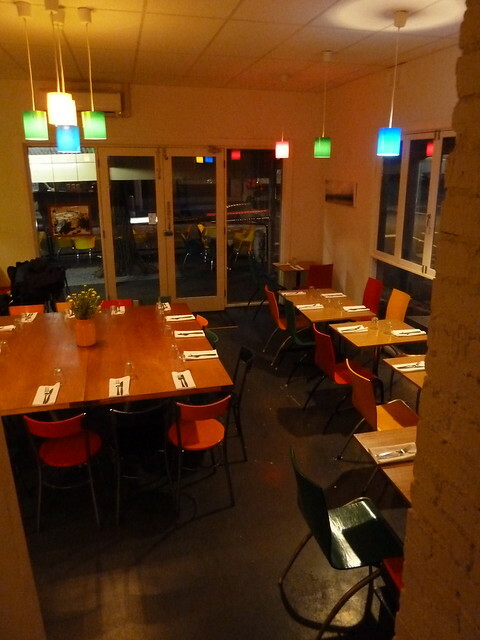 I attended Vy Vy as a guest of the proprietors. See end of post for full disclosure. It was just a normal Thursday. Lazily refreshing my inbox, wading between the Frequent Flyer missives I never read and foreboding overdue library book notices, I found a little gem. "We have been in business for 20 years and both my parents are the chefs," wrote infectiously chirpy Tiffany of her family's restaurant, Vy Vy in Flemington. 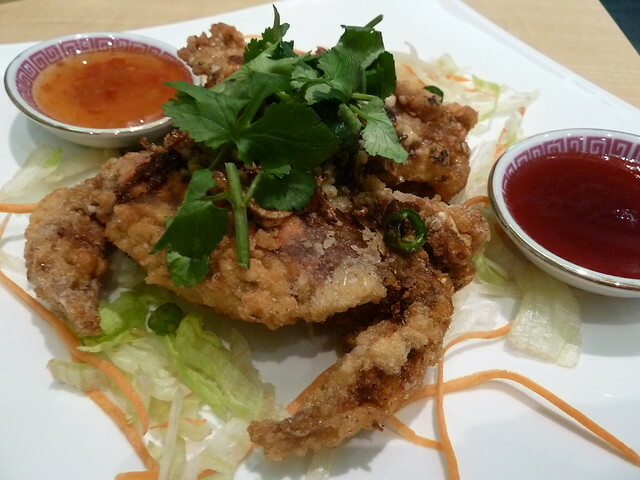 "We have many dishes we would love you to try, such as crispy soft shell crabs in spicy salt, vietnamese steamed rice rolls (banh cuon) freshly made and rolled, our laksas, salty fish chicken fried vermicelli, malaysian curries such as beef rendang, vietnamese curries, etc." 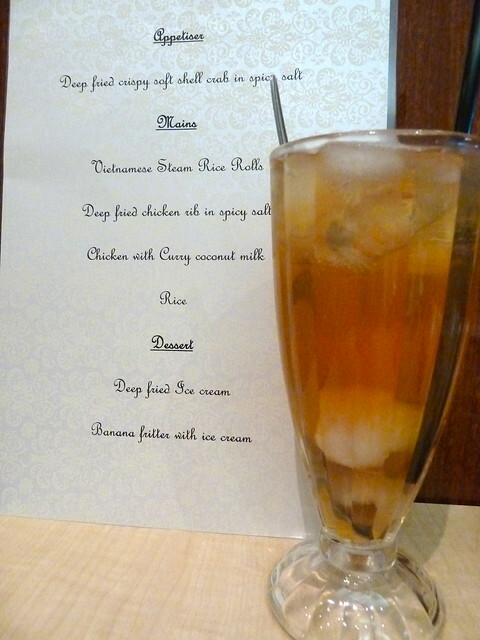 Fast forward two weeks and that's how S and I found ourselves ensconced at Vy Vy one Tuesday night, sipping at cooling homemade longan iced tea and ready for the gastronomic equivalent of a foot spa, massage and deluxe facial - a tummy pampering of epic proportions! 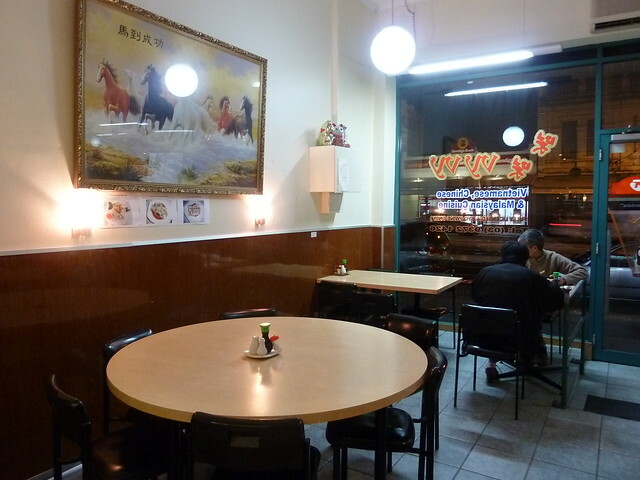 Vy Vy in Racecourse Road just turned 20 years old. 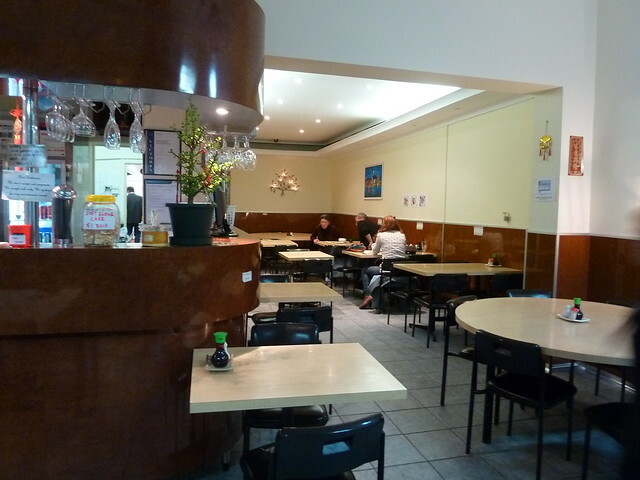 While the area around Racecourse Road is fast turning into Melbourne's Little KL, Vy Vy was actually the first Asian restaurant in the area. It is and has always been run by Winnie and Peter, now with the assistance of their gorgeous daughter Tiffany who runs Vy Vy's Facebook page. Winnie in particular is lovely, so hospitable and full of stories! It's spick and span inside and unashamedly old school - love it! As we dined, it became clear that many of the steady stream of customers were much-loved regulars, beckoning Winnie out from the kitchen for a chat or placing orders with the ease of reeling off lucky Tattslotto numbers. They may have lucky numbers but I have lucky dishes, and if soft shell crab is so much as hinted at I know I just have to have it. These crabs are harvested at an opportune time in their life cycle which means their shell is still pliable and can be eaten just as easily as the juicy meat inside. You are reading the words of the most squeamish offal virgin, so trust me, there is no ick factor - just all flavour! Vy Vy's were delicious, larger than other specimens, really meaty and with light, non-greasy batter. 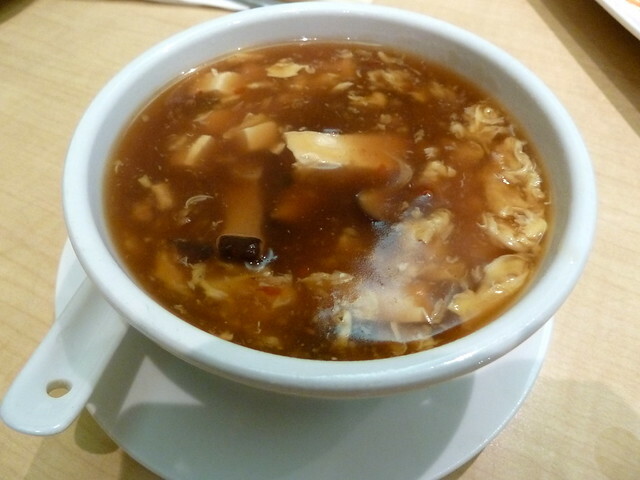 Wickedly good hot and sour soup with the perfect combo of pleasant sour tang, chilli heat, soothing glutinous texture and a cast of quality ingredients like silky tofu and tender Chinese mushroom. What had really piqued my curiosity in Tiffany's email was Vy Vy's fresh banh cuon. This is the same homestyle Vietnamese dish that I love for breakfast from Dinh Son at Little Saigon market - impossibly thin rice flour crepes filled with minced meat, rolled and topped with salad. 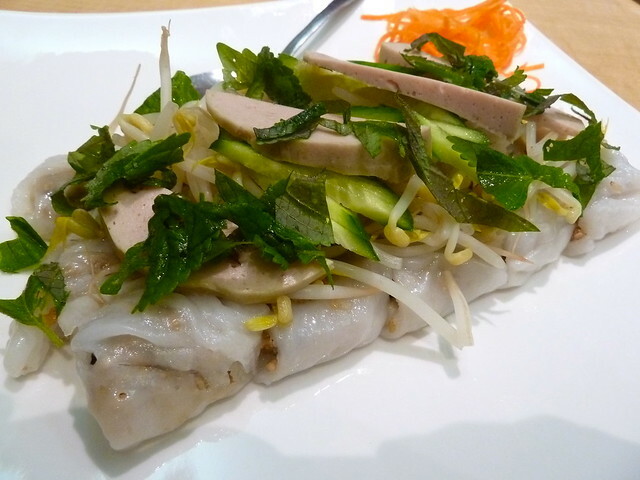 Fellow banh cuon fiends, Vy Vy's version is awesome. While Dinh Son do pre-make and reheat them, they're made fresh to order here, and are steamed the proper, old-school way instead of being made in a frypan. Winnie also reports she makes the batter from scratch and doesn't use any kind of packet mix. 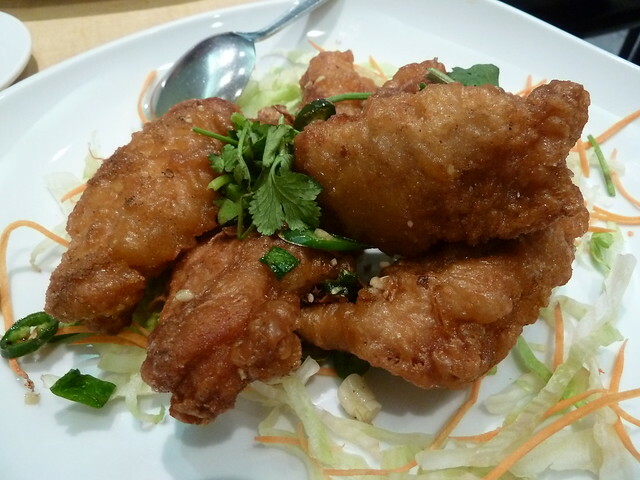 The filling here is minced chicken which gives them a more delicate taste. Combined with fragrant mint, crunchy bean sprouts and mild Vietnamese sausage, they are a winner! These have been a much-loved family recipe, and now Tiffany has convinced her mum that everyone else needs to try them too. Check out the other specials above, including vegetarian rolls in the middle. 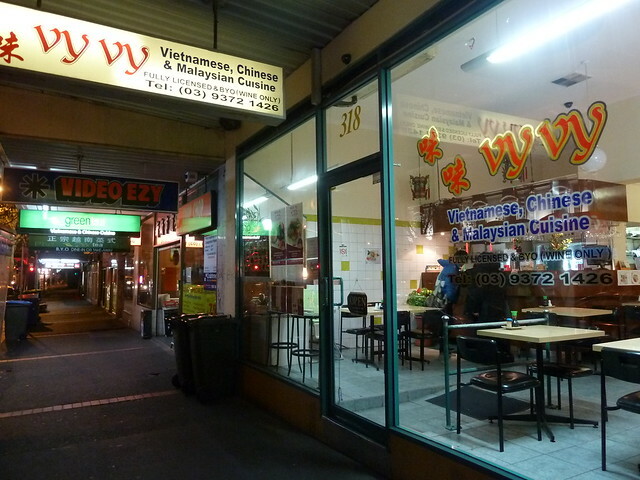 Vy Vy specialise in Chinese, Vietnamese and Malaysian food. I admit I'm often suspicious when a restaurant offers more than one cuisine, as I worry they're spreading themselves too thin. In fact, Winnie is originally from Vietnam and her husband Peter from China, and on her long journey to Australia, Winnie spent time in Malaysia where she learnt a lot about the cuisine there. 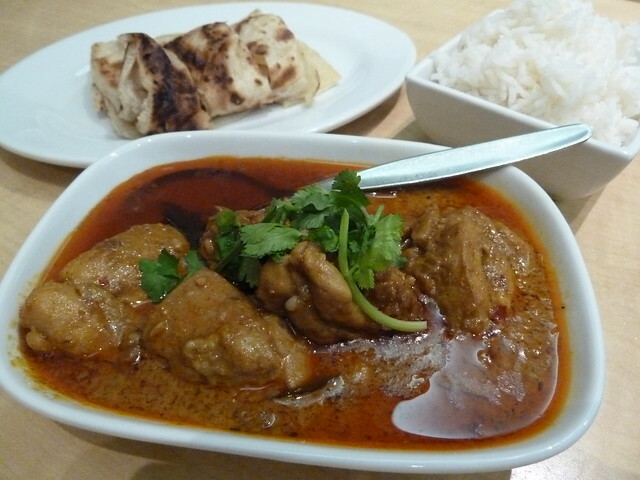 This is definitely evident in this awesome chicken curry, full of rich, warming spices and shiny green fresh curry leaves. I was worried at first that it would be too oily but it worked perfectly, especially with plenty of rice and crisp yet pliable roti for mopping up all that wonderful sauce. There are two types of people in the world - one who looks at the above and turns away in horror, and another who needs to step back and stop drooling on the keyboard. 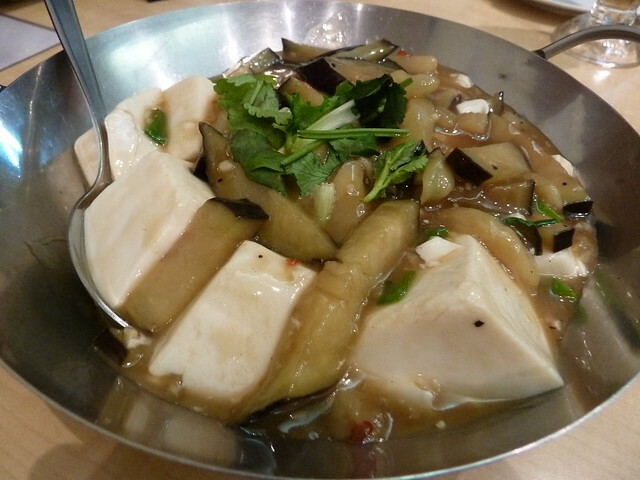 Eggplant and silken tofu are definitely a love 'em or hate 'em kind of deal - and I adore them. This is a vegan dish and it was fantastic, delicate yet full flavoured with a light, tasty sauce, the tofu melting like snowflakes in the mouth. I do love me a chicken rib, but we were so stuffed we could only manage one or two of these babies. They were delicious but I think had the skin on, which when battered really gilds the lily. Still yummy, just extra naughty! 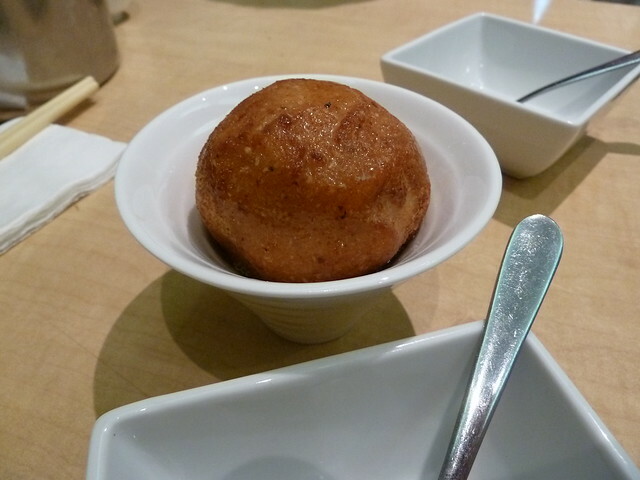 I have no idea how it is possible to deep fry ice cream, where a hot, crispy shell gives way to an icy scoop of vanilla. Like the best magic tricks, I have no intention of researching it and every intention of just enjoying it. Seriously, what is it with the "dessert stomach"? Somehow we managed to eat all of the above, despite being so full. 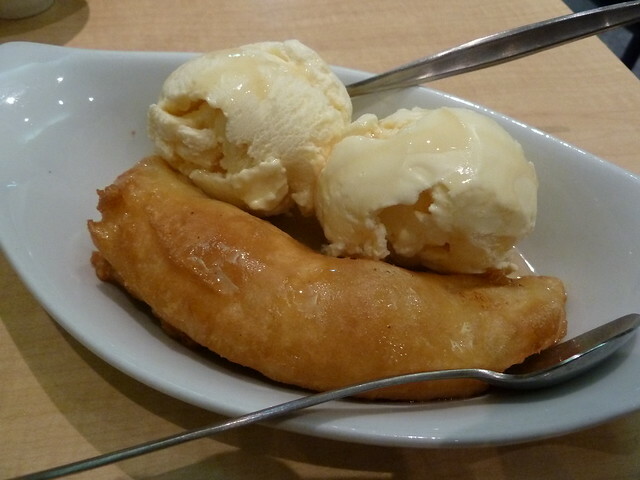 Top marks for great banana fritter action. 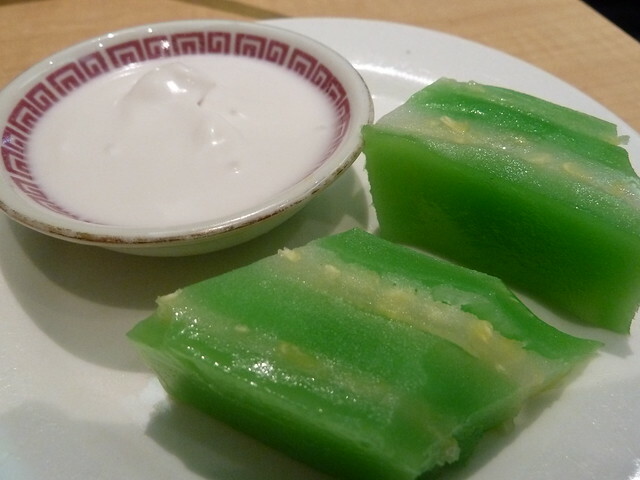 Tiffany often whips up little freebies for customers, whether they're home-made chocolates or these traditional Vietnamese steamed cakes, made with glutinous rice flour and mung beans and swiped through coconut cream. 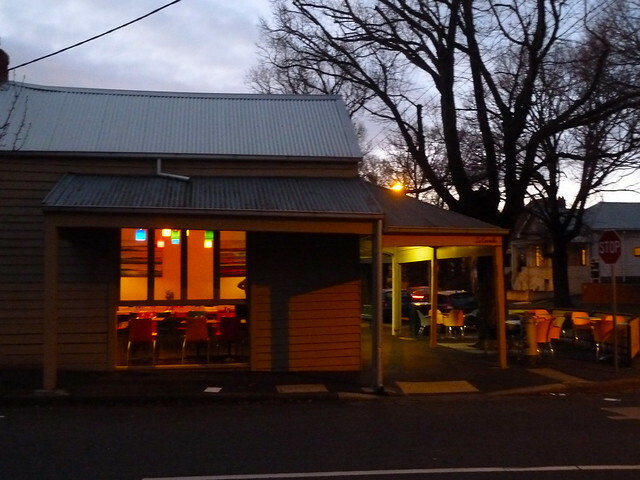 I was so pleasantly surprised by our gorgeous, authentic dinner here. On the surface Vy Vy may look like the suburban restaurants of your childhood, but this ain't your mama's Chinese takeout. 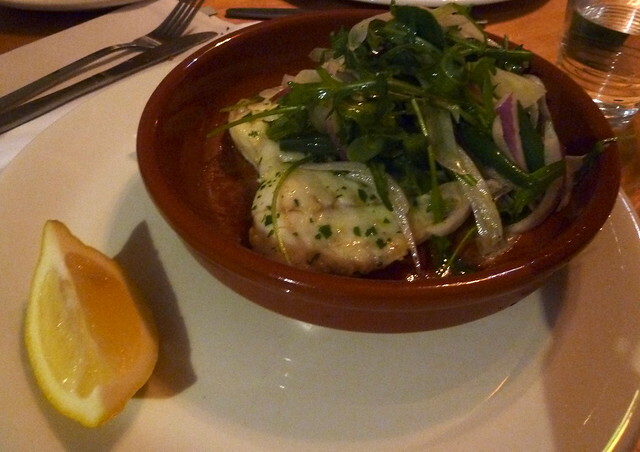 The menu is chockers with delicious traditional fare that's made with love and no cut corners. One thing to be aware of is that in response to some customers' concerns in the past, Winnie may modify dishes to suit the older Anglo-Australian generation's palate. Particularly in the case of fried noodles, if (like me) you covet that authentic wok hei charred flavour, you're encouraged to ask for them "authentic Chinese style". 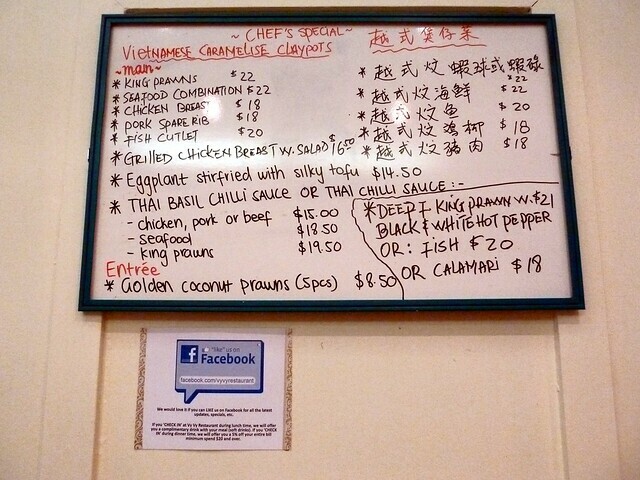 Disclosure: I attended Vy Vy as a guest which meant that in exchange for writing a post, a friend and I had a menu chosen for us and we did not pay for our meal. This offer was conditional on subsequently writing a post on Vy Vy. Vy Vy has not sought nor been given any editorial control of this post. "I'd like to book a table for eight, please - five kids in total." "Great! We'll put you in the back room, upstairs." Cue visions of a cobwebbed seclusion room for breeders and their spawn. 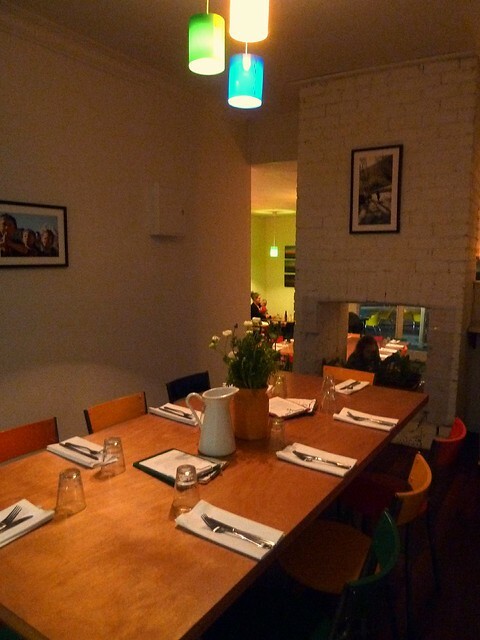 I imagined having to traverse this lovely neighbourhood bistro to "the back room", dragging my snotty children as diners looked on like smug business class passengers do as you stumble through to economy, head bowed. What awaited us "upstairs"? Boxes of napkins for seats and the only music the tinkle of a flushing toilet below? Imagine my delight when this is what I discovered La Cannella meant by "the upstairs back room". The stairs in question are only two or three and mean that your group can have relative seclusion, meaning that if you have kids with you, you may actually find dinner a relaxing experience. 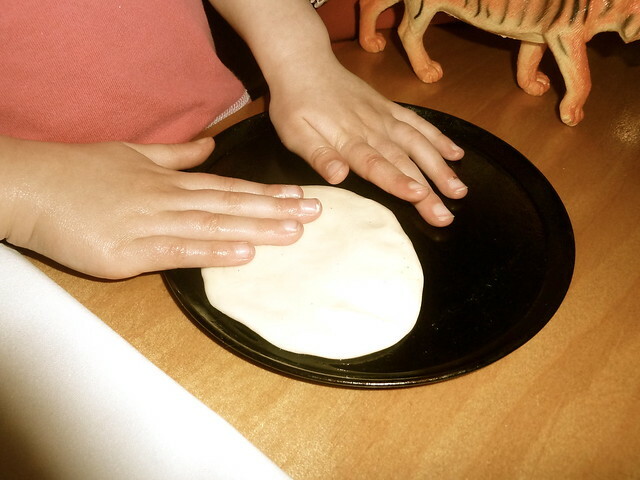 Now, not only will the lovely staff bring the kids unbreakable cups, allow them to play with the animals in the old fireplace (not as Victorian as it sounds) and ply them with colouring books, as well as delicious pizza, the big drawcard here is the "make your own pizza" activity for kids. 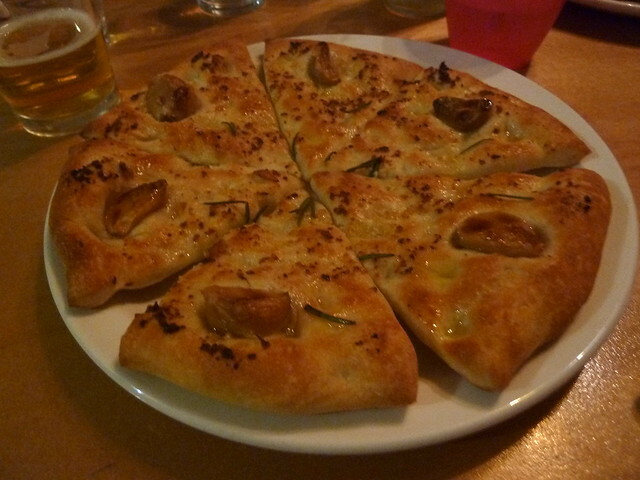 ...while parents can high five it over the table while reaching for a piece of this awesome foccaccia, each piece studded with a juicy, caramelised garlic clove. Grown-up pizzas are generously sized. 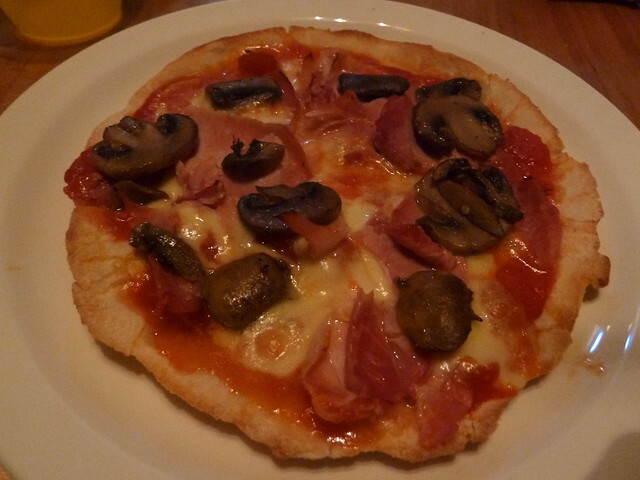 With six out of twelve pizzas vegetarian and gluten-free bases available, there's something for everyone. 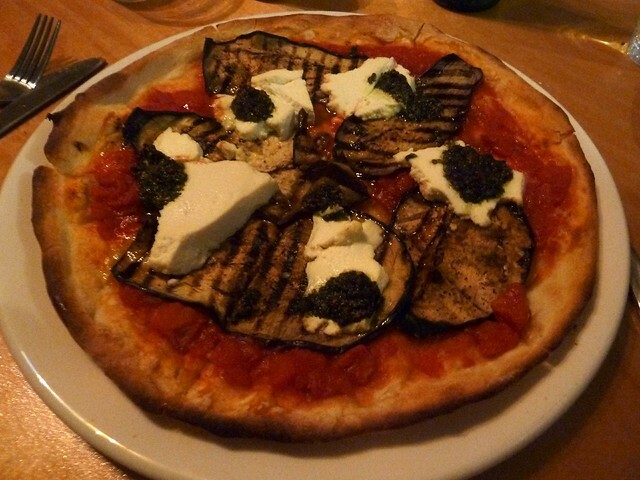 This eggplant number got the thumbs up. 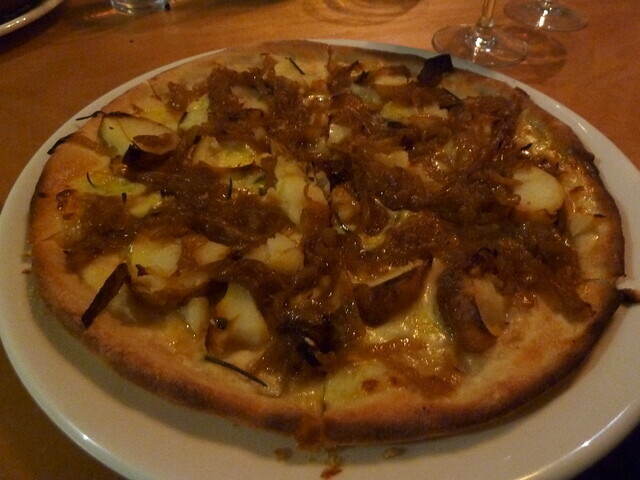 At first I found the chunky potato on my "Rustica" odd, as I had been expecting thinly sliced, but combined with silky sweet onion and a top-notch base, it won me over in the end. I'd love to check out their recent special, the Yabbie Dabba Do, with yabbies, marscapone and chives. 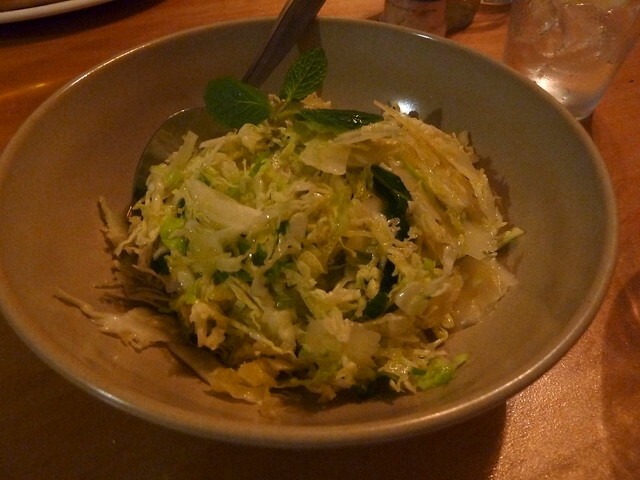 Big love for this clean and refreshing shaved Savoy cabbage salad with parmesan, lemon, pepper and mint - gorgeous! La Cannella also do daily-changing mains like slow-roasted pork belly, veal saltimbocca and gnocchi, perhaps baked with blue cheese. This blue grenadier was delicate, fresh and lovely. 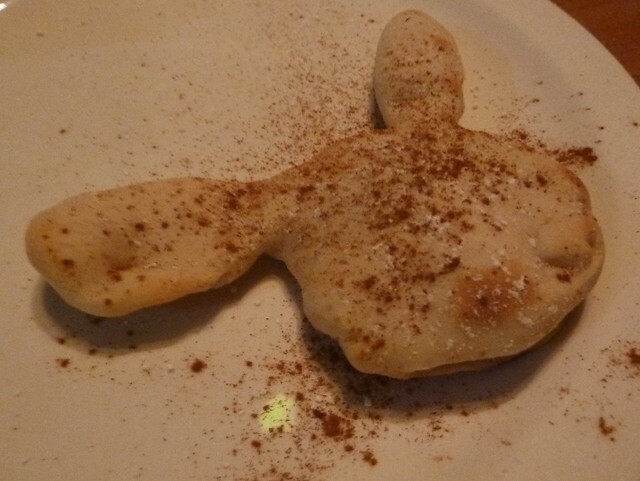 Dinner done, the kids' dough creations are returned to them, dusted in cinnamon and icing sugar! 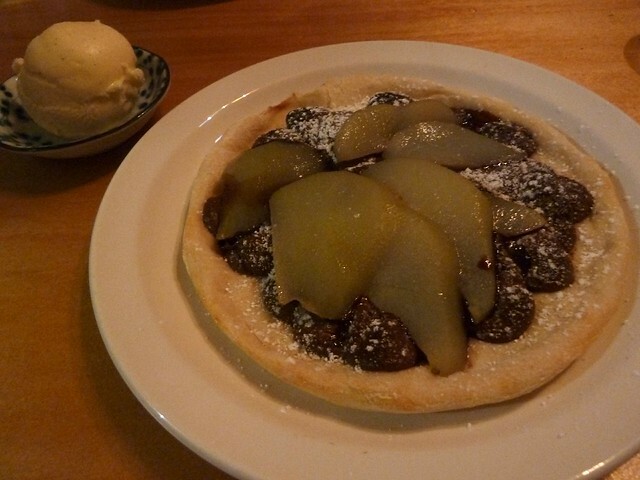 ...leaving surprisingly non-frazzled parents to enjoy ZEE BEST dessert pizza with luscious poached pears and a scandalous amount of molten dark chocolate. Fifty shades of yum. 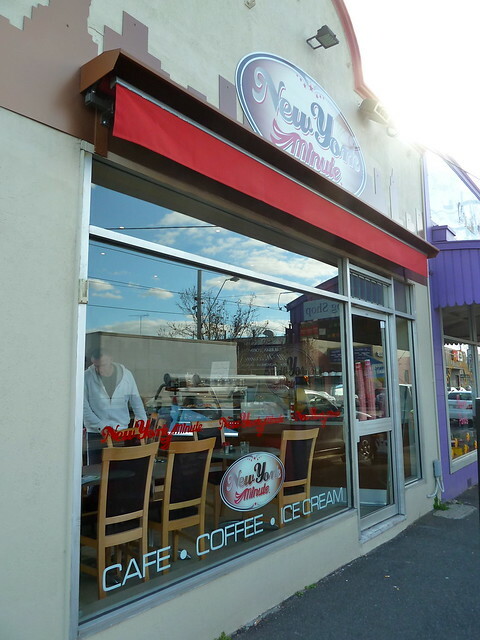 Coffee roasted by Flemington's STREAT (formerly the Social Roasting Company) tops off a dinner that has managed to please everyone - parents, kids and, in our child-centred world, the oft-forgotten other diners. With genuine, switched-on service, La Cannella make it seem almost easy. Thanks for the lovely company, M, B, C, E and F! I love living in the west, from being able to eat around the world in a day, to having awesome coffee, injera and cheese kranskies right at my fingertips (perhaps not all at the same meal, though!) However, it's important to remember that as cafes and gourmet supermarkets rise, other parts of our community remain static. The Star recently reported that Braybrook - right next to edgy cool WeFo - is the second most disadvantaged area in all of Victoria. The Leader reports that Braybrook grade 2 kids' reading levels are the third lowest in the entire state. So what can we do? One way is to get involved is CafeSmart, a new project by StreetSmart. When you buy a coffee tomorrow from a participating western suburbs business, 100% of $1 out of that coffee will be put into a fund. When the campaign's over, local organisations will be able to apply for grants out of that fund. 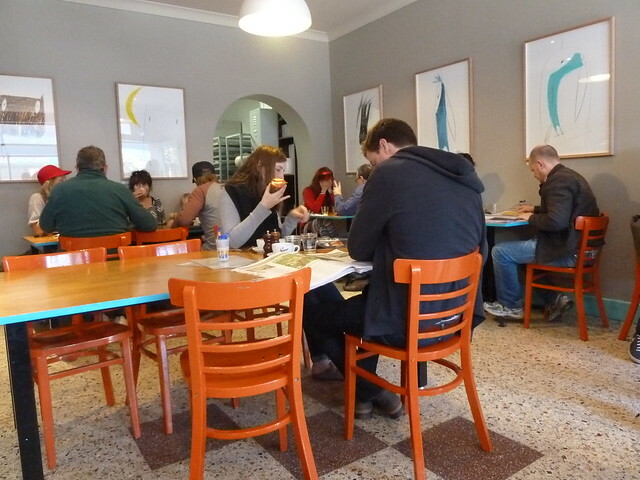 In the past, through CafeSmart and DineSmart StreetSmart has channelled funds to the Iramoo Youth Refuge in Footscray, Flat Out in Flemington (supporting women upon release from prison), and the Multicultural Sudanese Centre, also in Flemington. 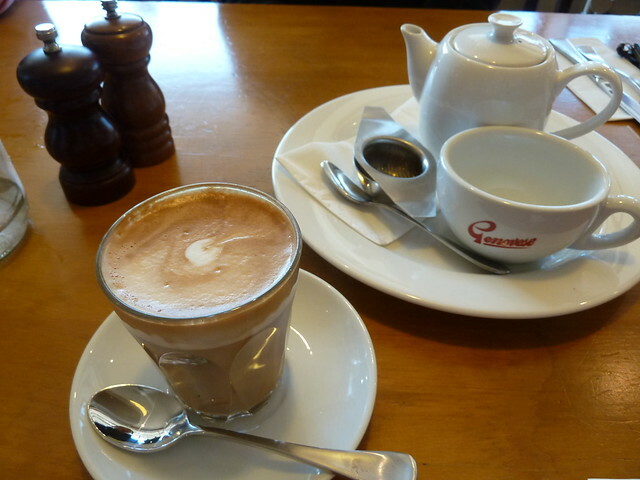 So let me twist your arm - go on, sigh a big heavy-hearted sigh and force yourself to buy a coffee from any one of these fabulous western/NW suburbs participating businesses. I know I will be doing my civic duty! Thanks very much to Kate from Sourdough Kitchen who got in touch to spread the word about CafeSmart. While we're here, let's talk about SK. There've been some changes here, from new staff, new bread lines (like beetroot and hazelnut) and a brand new cooked breakfast menu. I'm digging the natty blue aprons! 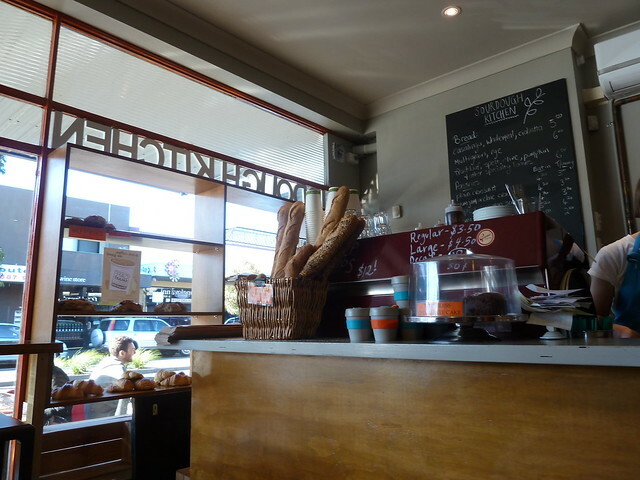 It was so busy here on a Saturday morning, and I can see how the staff have to juggle a line of customers wanting a loaf of bread plus a full house of eat-in patrons. They did a great job this morning. 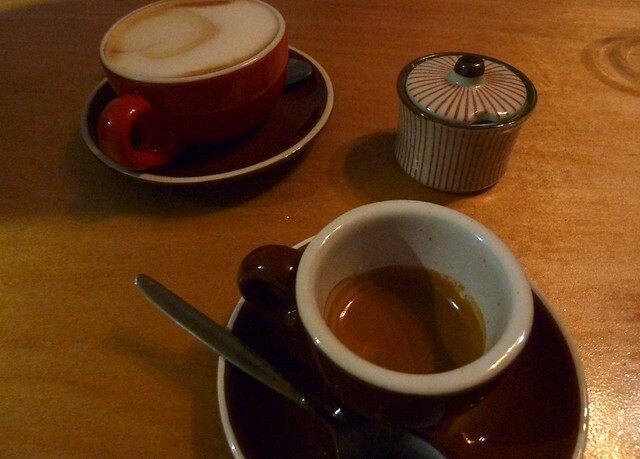 Coffee is by Genovese with that old-school, pleasantly bitter espresso edge. Sourdough have not gone too crazy with their breakfasts, evidently preferring to keep it simple and reply on good quality produce to do the talking. Bryan relished this simple combo of maple-glazed bacon, spinach, mushroom and perfect eggs. I covet Sourdough's pumpkin bread - so sweet and moreish. 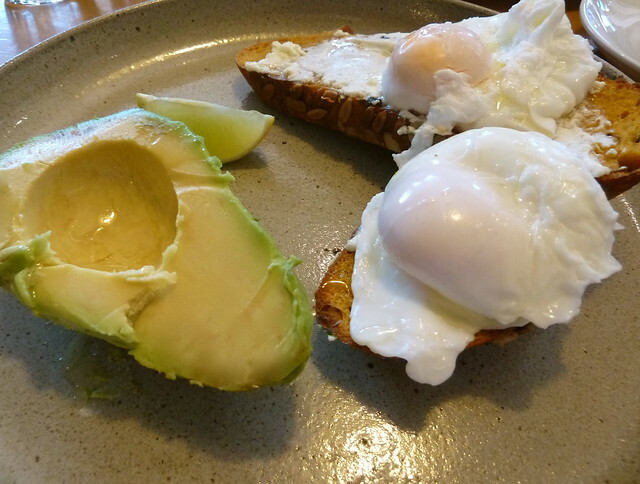 Here it came layered with premium Meredith goats' feta, poached eggs and avocado with a squeeze of lime. Simple yet simply delish. ...or the big berry scroll bursting with raspberries and melty dark chocolate! But most of all, buy a coffee from a CafeSmart participant tomorrow. You might think it's a drop in the ocean, but many drops make a drought-quenching rainstorm.